Monitoring of performance of CBIC Panel Counsels-Reg. Instruction on Solar Cells Safegaurd Duty. Enhancement of monetary limit – withdrawal of cases pending in the Supreme Court of India – reg. Procedure to be followed- at admission stage - in civil Appeal/SLPs filed by Parties in the Hon'ble Supreme Court of India. Instructions for effectively defending the interest of the Government in CAT/ High Court Cases - reg. Status of filling of Withdrawal applications before various Appellate FORA as required vide DO letter dt. 11.07.2018 -reg. Defence against Writ Petitions/PILs relating to GST-reg.
. Monthly Report of cases heard/decided in the Hon'ble Supreme Court in the month of May 2018. | Monthly Report May 2018. Instruction regarding Suo Motu Trasfer of authorisations on behalf of Union of India by the Authorised Commissioners.
. Monthly Report of cases heard/decided in the Hon'ble Supreme Court in the month of April 2018. | Monthly Report April 2018. "Filing of Special Leave Petition under Article 136 of the Constitution of India before the Supreme Court"
. Monthly Report of cases heard/decided in the Hon'ble Supreme Court in the month of March 2018. | Monthly Report March 2018.
. Monthly Report of cases heard/decided in the Hon'ble Supreme Court in the month of February 2018. | Monthly Report February 2018.
. Monthly Report of cases heard/decided in the Hon'ble Supreme Court in the month of January 2018. | Monthly Report January 2018. Monthly Report of cases heard/decided in the Hon'ble Supreme Court in the month of December 2017. Constitution of review commitee of Pr Commr. or Commr as a result of redistribution of cases. reg. Monthly Report of cases heard/decided in the Hon'ble Supreme Court in the month of November 2017. Constitution of fresh panel of Sr./Jr. Standing Counsels for handle CBIC cases of Indirect Taxetion before the various High Courts and other fora - Reg. Defence against Tax Appeals/ Writ Petitions/ PILs pertaining to Indirect Taxation pending in Hon'ble High Court (s). Monthly Report of cases heard/decided in the Hon'ble Supreme Court in the month of October 2017. Defence against Writ Petitions/PIL relating to GST. Monthly Report of cases heard/decided in the Hon'ble Supreme Court in the month of SEPTEMBER 2017. Letter -F.No.275/65/2013-CX.8A dated 27.09.2017 on the subject - Defence against Writ Petitions/PIL relating to GST. Instruction F.No.275/11/2017-CX.8A dated 18.09.2017 on the subject Filing of Special Leave Petition against Orders of Hon’ble High Courts staying Collection of Tax under GST- reg. DO Letter of Special Secretary & Member regarding Litigation Management. Monthly Report of cases heard/decided in the Hon'ble Supreme Court in the month of August 2017. Instruction regarding Reconsiliation of Commissioner Appeal figures between MPR and Legal Cell quarterly figures. Instruction regarding Monitoring of pendency with commissioner (Appeals). Withdrawal of Department’s appeals from Commissioner (Appeals) on the basis of earlier Supreme Court’s decision on identical matters. Member(Legal)'s DO letter and Annexure regarding withdrawal of appeals on the basis of revised Monetory Limits and earlie Supreme Court's decision on the identical matters. JS(Review)letter dated 25.07.017 regarding Withdrawal of Department's appeals from Commissioner(Appeals) on the basis of revised Monetory Limits and earlie Supreme Court's decision on the identical matters. 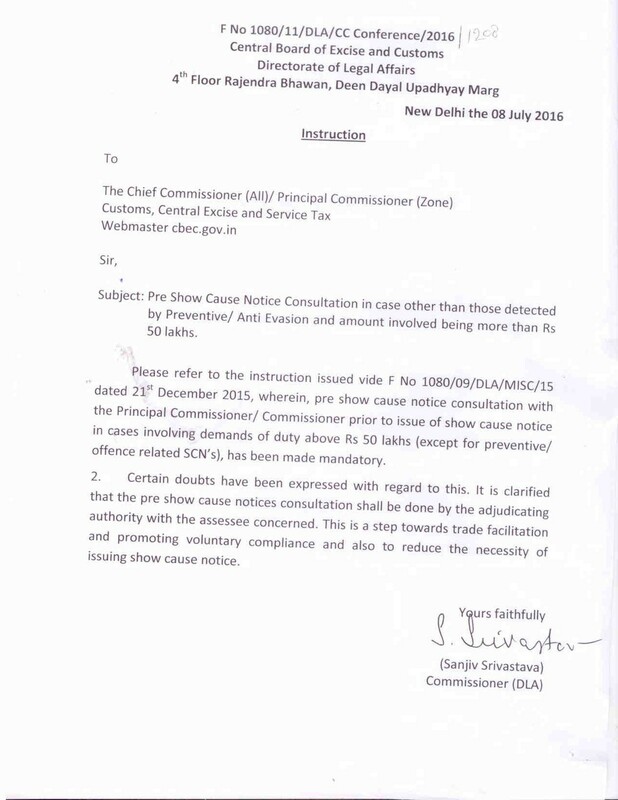 Inclusion of Show Cause Notice issued in relation to sub-section (11) of Section 28 of the Customs Act, 1962 on the competency of officers of DGDRI, DGCEI and Customs (Prev.) in the Call Book-reg. Public Interest Litigation (PIL) filed against implementation of Goods & Service Tax (GST) in the Hon’ble High Court of Bombay; Filing of Caveat in other High Courts. Implementation of Legal Information Management and Briefing System in CBIC. Monitoring of pendency of appeals-instructions. Board Instruction F.No.276/67/2014-CX.8A dated 15.05.2017 on the subject "Observation of Hon'ble Supreme Court in SLP (C) 3272-3276/2015-CCE, Ahemdabad-III vs. Gujarat State Petronet Ltd.; Need to carry out remedial action - reg"
Monthly Report of cases heard/decided in the Hon'ble Supreme Court in the month of APRIL 2017. Hon'ble Punjab & Haryana High Court Order dated 22.03.2016 in Civil Writ Petition No. 24967 of 2015 in case of M/s. NVR Forgings and in CWP No. 26321/2016 in case of M/s. Modi Springs Pvt. Ltd.- reg.